Motorola's successful analogue MicroTAC was chalking up sales in the UK and the USA. Although they based their first attempt at digital phones on the heavy transportable and brick forms, the small, light and trendy MicroTAC seemed the obvious choice for the new technology. 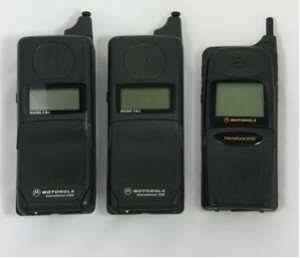 From 1994 Motorola brought out a succession of new phones developed from the MicroTAC for GSM. With the digital phones the 'flip' became a thin piece of plastic covering the keys. Digital circuitry was more bulky and this was a way of hiding it. Motorola developed a range of these phones from 1994 to 1997 catering from every price point from entry level to prestige phones. Motorola also developed the basic MicroTAC digital phones for the One2One and Orange networks. One2One's more expensive phone, the M300, was a restyled Motorola flip phone and Orange offered the MR1 as an alternative to the Nokia 2140. The MicroTAC series was eventually eclipsed by the smaller and lighter StarTAC at the top end and by cheaper phones such as the budget Motorola Memphis at the bottom end of the market. "i need motorola international 7500. Poseo un tel?fono Motorola International 6200, de Movistar en su estuche original con todos los accesorios y, me gustar?a saber si es una pieza interesante para coleccionistas y que valor puede tener. Estuve investigando un poco por la red y, vi esta p?gina, es el motivo por el cual me pongo en contacto con Utds. I have a Motorola International 6200 phone from Movistar in its original case with all the accessories and I would like to know if it is an interesting piece for collectors and what value it can have. I was researching a little on the net and, I saw this page, is the reason why I get in touch with Utds.